Tek Recon broke out at last year's Toy Fair with it's app, new styled, reusable rubber ring NRG ammo, and promises of high capacity and high ranges mixed with video game FPS action. The Hammer Head and the Havok generated a lot of buzz via Kickstarter and E3, with some astounding community outreach there and through Facebook. That was the past though, and now for New York Toy Fair 2014, Tek Recon brings you... the Predator. They sent out a press release around this AM, and here are some highlights! "The Predator features rapid slam firing, with ranges exceeding 100 feet. It holds up to 100 ‘NRG’ rounds, more than any other reusable ammo blaster. To help enhance the Tek Recon experience, a newly designed magazine that allows for rapid loading firing will be introduced to enhance the battle experience. The Predator comes equipped with six accessories; including scopes and LED targeting technology that can be customized and mounted on tactical rails. ....In addition to the Predator blaster, new accessories for 2014 include different performance ‘NRG' rounds, like Long and Soft shots. These special rounds come in a variety of colors and provide more customization for the fans." So there you have it. The special rounds of varying styles that dartblaster.de showed, and a new blaster. I'm guessing I'll get a look at the new cradle too. Should make for an interesting Toy Fair and year in blasters overall. Thoughts? 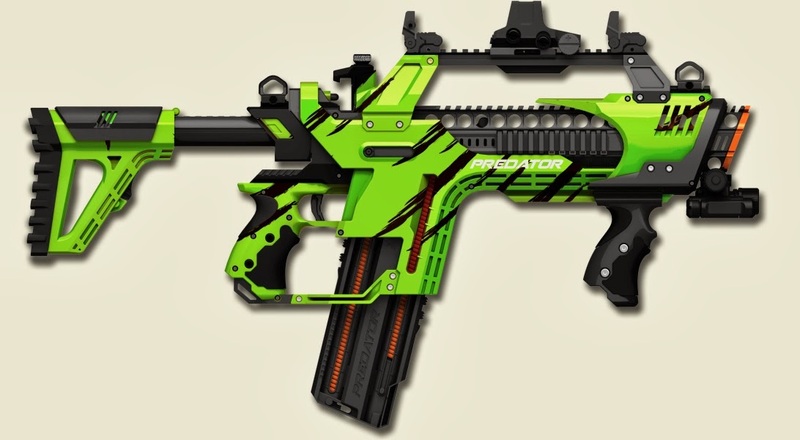 I got some clarification, and they're referring to this being more rounds than any other Tek Recon blaster, as the Hailfire has a max of 144 rounds. Anyway, thoughts? How have you liked Tek Recon thus far?